We start with a traditional Stardom opener, which is a bunch of young wrestlers with a veteran to hold things together (Yoneyama in this case). This is the first time I have seen Nishina, she also is affiliated with Actress girl’Z like Maki is. The match got plenty of time so hopefully all the young wrestlers get a chance here to impress, in particular looking forward to seeing more of Maki and Starlight Kid as both show a lot of potential. Azumi and Starlight Kid begin the match, they trade dropkicks until Azumi starts working on the kid’s arm. Well the other kid. Starlight Kid gets out of it and they tag in Yoneyama and Mimura. They chest bump, Yoneyama makes Mimura run the ropes until she gets tired is easily hiptossed for a two count. Mimura tags out due to exhaustion as Nishina and Maki are brought in, Maki kicks down Nishina but Yoneyama kicks her from the apron. Dropkick from Nishina as Azumi and Yoneyama both get in the ring to help and pose on Maki. Yoneyama stays in and chops Maki before applying a leg lock, Mimura comes in and elbows Yoneyama which simply applies more pressure to the move. Maki gets away and tags Starlight Kid, and Starlight Kid hits the backflip into a standing moonsault for a two count. Mimura comes in and Starlight Kid runs up Mimura to hit a Shiranui onto Yoneyama. Starlight Kid gets on the second turnbuckle and she hits the diving body press for a two count. Yoneyama has had enough and slams Starlight Kid, and she tags in Azumi. Azumi dropkicks Starlight Kid and they trade elbows, DDT by Azumi and Nishina runs in with a Somato. Suplex by Azumi, but Mimura breaks up the cover. Azumi dropkicks Mimura but Mimura applies the rolling leg submission as apparently they are legal now (did I miss a tag or do they just not care?). Mimura smacks Azumi in the back of the head and dropkicks her, Starlight Kid picks up Azumi (guess she hadn’t tagged in) and she hits a Tiger Feint Kick for a two count. Starlight Kid tags Mimura, sliding crossbody by Mimura and she gets a two as well. Mimura dropkicks Azumi and slams her, but Yoneyama breaks up the cover. Starlight Kid hits a headscissors on Yoneyama, Maki and Nishina get in the ring and Maki hits a swinging neckbreaker. Yoneyama and Azumi come in but Azumi dropkicks Yoneyama on accident, La Magistral by Mimura on Azumi but it gets two. Mimura starts her rolling leg hold but stops halfway and holds Azumi in a cradle, and she picks up the three count! Mimura, Maki, and Starlight Kid win! This was longer than the typical Stardom opener, I am not sure if that is a new direction or just the way it went since six wrestlers were in the match. As for the good parts – Starlight Kid was more smooth than she has been recently, it is expected of course for a new 15 year old wrestler to have good days and bad days but this was a good day. The action was fast paced, no real lull anywhere which is always a plus. I thought that Maki has good… gymnastics, she hasn’t really put it together yet in terms of wrestling itself but the base is there to do entertaining things. The main issue is that it wasn’t the most fluid match, a few pauses and re-starts with random wrestlers running in with little structure to it. A perfectly watchable match with some bright spots, but not much more than that even though I always enjoy seeing the rookies. This is an interesting pairing and I do not know why it exists. Alex Lee is a well traveled Freelancer and a solid wrestler, but isn’t a big part of Stardom’s storylines. Diemond is part of Oedo Tai and is accompanied to the ring by Kris Wolf and Act Yasukawa, but normally she teams with Viper and doesn’t really have any beef with Lee in particular. This match is really just filler of sorts, since Diemond’s tag partner Viper had a match later in the card it made sense to have Diemond on the card also, but there really isn’t a backstory here to explain why they are fighting. Lee immediately takes Diemond to the mat, kicks to the chest by Lee and she covers Diemond for two. Wolf trips Lee from ringside to help Diemond out, Diemond picks up Lee and throws her down by the hair. Sidewalk Slam by Diemond but Lee gets the armbar applied until Diemond gets a foot on the ropes. Lee charges Diemond but Diemond hits a backbreaker, Lee falls out of the ring and she is attacked by both Wolf and Yasukawa. Lee is rolled back in, Diemond gets her in the ropes and she is attacked by all three members of Oedo Tai. Diemond goes for a leg drop but Lee moves, jumping knee by Lee in the corner and she delivers a kick combination. Lee gets on the second turnbuckle and hits a missile dropkick, covering Diemond for two. Lee goes for a Chokebomb but Diemond blocks it and hits a side slam. Knee by Lee and she delivers a buzzsaw kick, cover by Lee but Diemond kicks out. Superkick by Lee and she hits the Chokebomb, but Diemond barely gets a shoulder up. Yasukawa gets on the apron while Diemond gets some Sake, she spits it into Lee’s face and applies the schoolboy for the three count! Kaitlin Diemond steals the victory. I won’t complain about any match that gets Yasukawa and Wolf on my screen but this was a pretty simple match. I will give them credit, I liked it more than I thought I would as everything was smooth and they stayed active from bell to bell. It worked well to put over Oedo Tai as the lead faction in Stardom, but overall it was just a standard midcard match. Seeing Kagetsu back in Stardom makes me a happy panda, as she is one of my favorite young Freelancers. She is teaming with Stardom regular Matsumoto, one of the most respected Freelancers in Joshi. On the other side are two of Stardom’s young wrestlers, with almost 16 year old Watanabe and rookie Jungle Kyouna. This is a good chance for Kagetsu to further make an impression in Stardom, as well as good experience for the Stardom youngsters. Kyouna is wearing lots of make-up and its freaking me out a bit, she looks really different. Watanabe and Kagetsu start off, armdrags by Kagetsu and she dropkicks Watanabe, but Watanabe dropkicks her back. Both wrestlers tag out, Matsumoto and Kyouna run into each other until Matsumoto shoulderblocks Kyouna to the mat. Kyouna lariats Matsumoto in the corner but Matsumoto suplexes her and tags in Kagetsu. Kagetsu tries to pick up Kyouna and eventually hits a bodyslam, picking up a two count. Matsumoto is tagged back in and she chops Kyouna before applying a chinlock, stretch hold by Matsumoto and Kagetsu dropkicks Kyouna in the face. Kagetsu elbows Kyouna in the corner but Kyouna picks her up and tosses her to the mat. Kyouna tags in Watanabe, Watanabe elbows both Kagetsu and Matsumoto and dropkicks Kagetsu in the corner. Missile dropkick by Watanabe to Matsumoto, Kagetsu tries to do a springboard move but trips, so Watanabe dropkicks her again. More dropkicks by Watanabe and she hits a suplex, covering Kagetsu for a two count. Samoan Drop by Kagetsu, and she makes the hot tag to Matsumoto. Matsumoto gets Watanabe on her shoulders and throws her at Kyouna, knees by Matsumoto and she boots Watanabe in the chest. Kyouna grabbed Matsumoto, allowing Watanabe to dropkick her, and Watanabe tags in Kyouna. Face crusher by Kyouna to Matsumoto, and she gets a two count. Matsumoto shoulderblocks Kyouna over but Kyouna hits a powerslam. Lariat by Kyouna, and she covers Matsumoto for two. Kyouna goes up top but Kagetsu joins her, Matsumoto then goes up to them but Watanabe dropkicks Matsumoto. Kyouna dives off the top with a body press to Matsumoto, but it only gets two. Watanabe returns but Kagetsu hits a swandive missile dropkick on both of them. Matsumoto and Kagetsu double team Watanabe, backdrop suplex by Matsumoto to Kyouna and she gets the three count! Matsumoto and Kagetsu are your winners. The gaijin monsters collide! This is Alpha Female’s first match in Stardom in over a year, as the former champion finally returns. She goes straight for the jugular, as while Viper has inserted herself as the top gaijin in Stardom, Alpha Female wants to show that she is still the best. A simple story but an easy to understand one, this one isn’t about being the crowd favorite, it is about finding out who the most dominate gaijin in Stardom is. They tie-up to start, Alpha Female shoulder tackles Viper in the corner, but Viper comes back with a body avalanche. Alpha Female kicks her back when she tries again, she goes for a bodyslam but Viper blocks it. Sleeper by Alpha Female but Viper gets out of it, running knee by Viper in the corner but Alpha Female fires back with lariats. Viper doesn’t go down and charges Alpha Female, but Alpha Female holds down the top rope and Viper falls out of the ring. Alpha Female goes out after her and gets a chair, but Act Yasukawa grabs it and hits Alpha Female in the head with it. Both wrestlers are rolled back in and trade elbows on their knees, they keep elbowing each other until Alpha Female goes for a body slam and Viper lands on top of her. Running senton by Viper, she goes for a slam but Alpha Female gets away and applies a sleeper. Viper rams Alpha Female into the corner to get out of it but she avoids Viper’s charge and chokes her in the corner. Elbow by Alpha Female and she clubs Viper repeatedly in the chest. Armtrap crossface by Alpha Female but Viper gets out of it, Viper gets on the second turnbuckle but Alpha Female knocks her off. Alpha Female goes up top but Viper walks too far away so she jumps off and slaps her. Bodyslam by Alpha Female, and she covers Viper for two. Alpha Female tries to pick up Viper, Yasukawa runs in the ring but Alpha Female pushes the referee into her. Viper accidentally hits a running crossbody on the referee, she then flattens Alpha Female but the referee is out. He wakes up angry, and he DQs Viper for crushing him. Alpha Female wins the match! This match is for the Goddesses of Stardom Championship. On paper this is a bit of an unusual match. Thunder Rock is one of the best tag teams in the world, period, as both have three titles each and this is their ninth defense of the Goddesses of Stardom Championship. On the other side are two great wrestlers in Hojo and Satomura, but needless to say they are not a regular tag team. In fact they feuded for all of 2015, having some of the best matches of the year, and generally don’t get along. While they are on the same page here to try to win the titles, they don’t have the teamwork and chemistry that Thunder Rock do which may become a problem. Iwatani and Satomura are the first two in the ring, elbows by Satomura but Iwatani blocks one and hits the split-legged armdrag off the ropes. Iwatani kicks Satomura in the back but Satomura has none of that and hits a scoop slam. Iwatani tags in Shirai, Satomura works the headlock but Shirai gets away from her and they return to their feet. Satomura tags in Hojo, Hojo and Shirai trade elbows, Iwatani runs in and they both dropkick Hojo. Hojo is double teamed in the corner and is put in a double armbar, Shirai slams Hojo and puts her in a crab hold. Satomura encourages her from the apron, double kneedrop by Shirai to Hojo’s back and she hits a standing moonsault. Shirai tags in Iwatani, Iwatani chops Hojo in the corner and dropkicks her in the chest. Footstomps by Iwatani and she tags Shirai back in as they continue to focus on the weaker Hojo, Hojo finally fights back against Iwatani but Satomura isn’t around for the tag. Iwatani tags Shirai, Shirai goes for an underhook facebuster but Hojo blocks it and hits a Sliding D. Hojo makes the tag to Satomura, Satomura elbows Shirai but Iwatani runs in and elbows her. Satomura is dropped by a double vertical suplex but Satomura fights back, Shirai goes for a swandive dropkick but Satomura uppercuts her out of the ring. Iwatani is dumped out of the ring, Satomura and Hojo join them and attack the champions around the ring. They fight up near the balcony, Satomura and Hojo both get on opposite balconies and dive down onto their opponents! Satomura is crazy, I expect that from the kids, not her. Satomura and Shirai return to the ring, Hojo gets up top and hits a diving forearm smash on Hojo on Iwatani, Satomura elbows Shirai and kicks her repeatedly. Shirai snaps off a hurricanrana and hits a head kick, dropkick by Shirai and she tags in Iwatani. Iwatani goes up top and hits a missile dropkick, Iwatani hits another dropkick and then drills Satomura while she is against the ropes. Northern Lights Suplex by Iwatani, but Satomura kicks out at two. Iwatani goes up top but Satomura moves as she dives off, heel kick by Satomura and she hits a backdrop suplex for two. Satomura tags in Hojo, running neckbreakers by Hojo and she covers Iwatani for a two count. Hojo chops Iwatani in the corner but Iwatani comes back with a high kick. Big spear by Hojo and she rolls up Iwatani for two. Satomura comes in but Shirai hits a swandive missile dropkick on both, knocking the challengers out of the ring. Shirai and Iwatani then get onto different turnbuckles and dive out of the ring onto their opponents. Iwatani rolls Hojo back in, she goes up top and delivers the diving footstomp for two. She goes up top again and hits a diving bodypress, but Satomura breaks up the cover. Shirai picks up Hojo and Iwatani hits a face crusher, superkick by Iwatani to Hojo and she covers her for a two count. Tiger Feint Kick by Shirai, she goes up top and hits a missile dropkick. Running double knee by Shirai and she hits the double underhook facebuster. Shirai picks up Hojo while Iwatani goes up top but Satomura knocks Iwatani off. Satomura tries to kick Shirai but knocks Hojo’s head off by accident, she tries again but has the same result. La Magistral with a bridge by Shirai, but Satomura breaks up the pin. Shirai picks up Hojo and hits a German suplex hold, but Hojo barely kicks out. Shirai goes up top but Satomura kicks her, Hojo recovers and goes up top herself, hitting a footstomp to Shirai’s chest. Sliding D by Hojo, but Iwatani breaks up the cover. Hojo and Shirai trade elbows but Satomura drills her with the Pele Kick. Death Valley Bomb by Satomura, Hojo goes up top and she nails the diving elbow drop, but Shirai somehow kicks out. Satomura slams Iwatani on top of Shirai but Shirai gets her feet up when she goes for another diving elbow drop. Hojo chops Shirai in the face but Iwatani gets away from Satomura, Shirai picks up Satomura and they hit the assisted piledriver. Iwatani grabs Hojo and hits a dragon suplex, Shirai then goes up top and nails the moonsault for the three count pinfall! Shirai and Iwatani retain their championship! Mark and I discussed this event on Joshi Island #1, you can check it out below if you would like an audio review of the show as well. From top to bottom this was a well structured show. It had a couple rookie and young wrestler matches, which is normal in Stardom these days as that is the bulk of their roster, but they were well supported by the hoss match and a near-epic main event. Diemond/Lee was the only match that didn’t really fit in, but even it wasn’t a bad match, it just didn’t bring a lot to the table in the grand scheme of things. 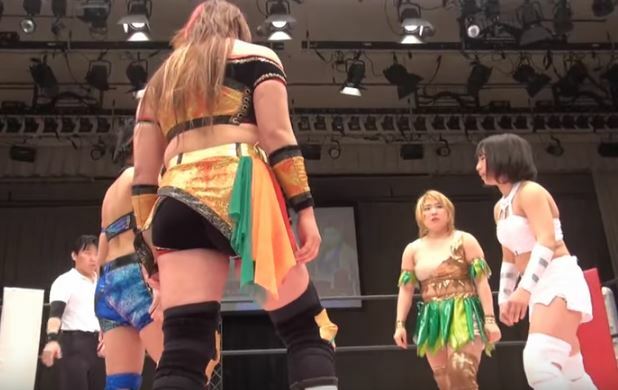 The main event may end up being one of the best Joshi matches of the year, with four of the top Joshi wrestlers going at it for 25 minutes in a seamless and non-stop match. A fun show overall, but don’t miss the main event.